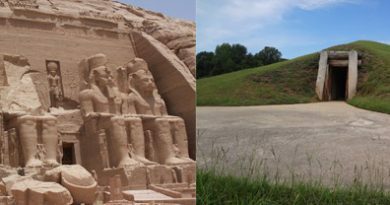 Was the Ocmulgee earth lodge an astronomical observatory and sophisticated scientific apparatus designed to forewarn its designers of impending catastrophe coming from the heavens? 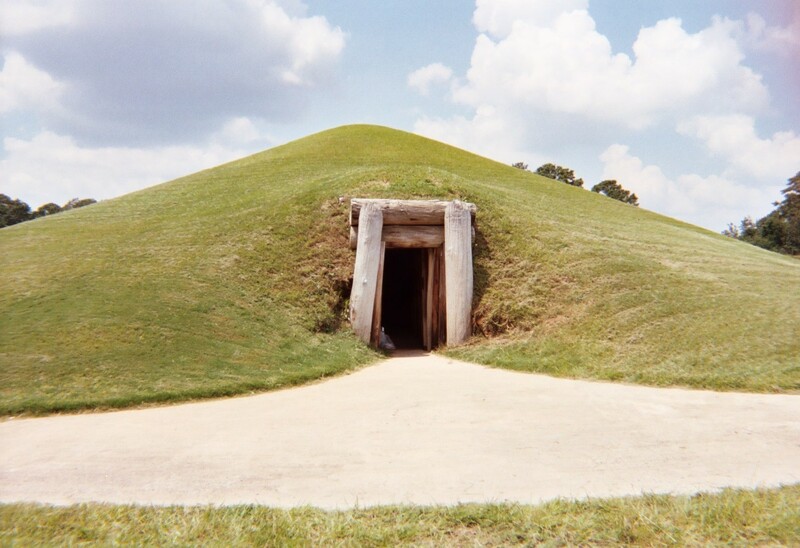 The earth lodge at the Ocmulgee Mounds site in Macon, Georgia is a unique building among Native American archaeological sites in the Southeast. 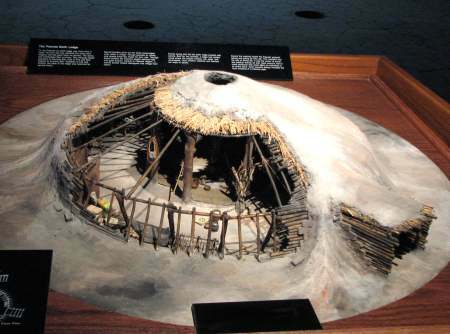 It is a round building completely covered with earth except for a smoke hole in the center of the roof to allow smoke to escape from the central fire pit below. Entry into the earth lodge was from the east through a low, long, tunnel-like, earth-covered corridor. One would have to crouch or crawl until he reached the central, round chamber before he could stand fully erect again. According to the Creek Migration Legend this structure was where the tribe’s warriors would gather “to fast and purify their bodies,” thus entry was likely limited to males exclusively. The main chamber was bounded by a low wall upon which rested the lower ends of the roof timbers. There were four large upright posts in the middle of this circular chamber that supported four horizontal posts that formed a large square. The middle of the roof timbers rested on these horizontal timbers and on top of these timbers earth was piled thereby creating the earth-covered roof of this structure. The roof timbers did not all meet in the center instead leaving a large hole through which smoke could escape. In the center of the floor between these four upright posts was a large fire pit molded into the clay floor. Along the floor against the circular low wall were a series of 47 seats molded into the clay floor. Each had a small cubbyhole molded into the front of the seat, the exact purpose of which is unknown although it was likely a place to store personal items. On the western end of this round chamber was a large, elevated platform or altar in the shape of a bird. The bird likely represented a raptor, either an eagle or falcon, both highly revered among Creek Indians. Surrounding the eye of the raptor was a design known as the ‘forked eye motif.’ It had the appearance of a two-tailed comet. (More on this later.) This is the earliest known instance of this symbol, which eventually became widespread throughout much of Southeastern and Midwestern America. One researcher noted that mythological beings represented with the forked-eye surround were associated with the celestial realmwhich is consistent with a comet interpretation. Finally, three more seats were located on this platform bringing the total number of seats in this great chamber to fifty. Clearly these three elevated seats were reserved for very important persons. 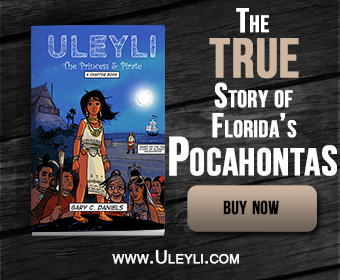 The only artifact excavated from the interior of the chamber was a large conch shell. These shells were reserved for serving a ritual tea known as both the “black drink” because of its color and the “white drink” because of its use in purification rituals. The tea was made from the leaves of the yaupon holly plant. The leaves of this plant had high concentrations of caffeine, many times more than a similar amount of coffee, and was drunk piping hot thus increasing the absorption of caffeine into the bloodstream. In other words, during the time period that the migration legends were recorded, no known structure similar to an earth lodge was in existence thus: 1) how could a Native American informant at this time describe such a structure while recounting his tribe’s migration legend and 2) how could the description of this structure match perfectly with the archaeological data from excavations conducted nearly 200 years afterthe legend was recorded? Either the informant in question was psychic or the legend is an accurate recounting of real historical events. 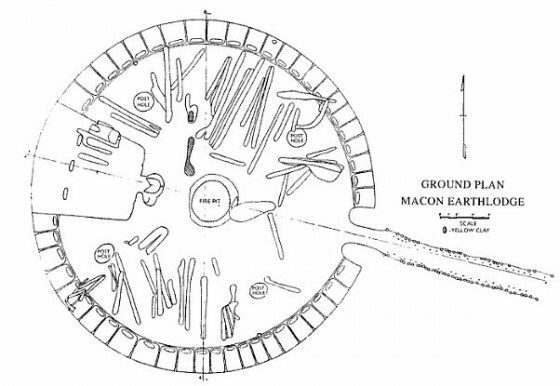 This very uniqueness caused Larson to call into question Kelly’s “earth lodge” interpretation of his findings and Larson even went so far as to refute the very existence of earth lodges in the Southeast even at Ocmulgee Mounds. Yet the migration legend seems to support Kelly’s interpretation of the data as, indeed, a “mound with a central chamber,” i.e., earth lodge. the presence of four main interior support posts correctly aligned to the semicardinal points. 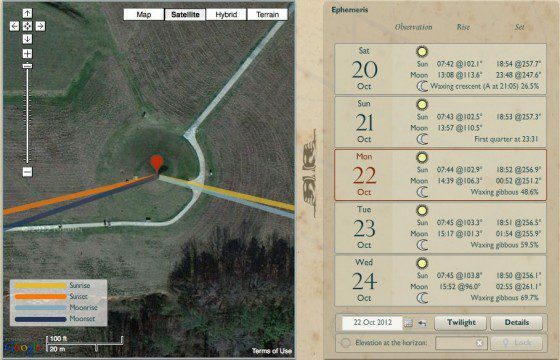 This satellite image shows the door of the earth lodge perfectly aligned with the sunrise (yellow line) on October 22. ©The Photographer’s Ephemeris & Google Maps. Why would the builders have chosen this date instead of the vernal equinox? Was there any significant astronomical event on this day that they may have wanted to mark? 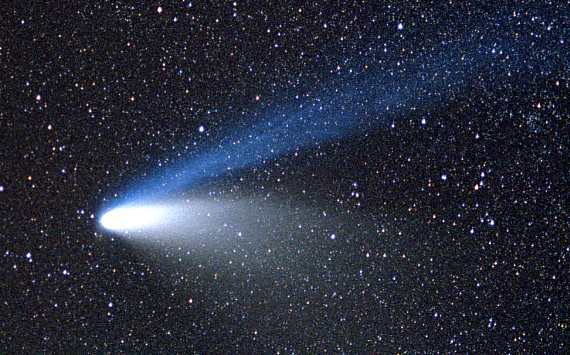 In our current era, October 22nd represents the peak night of the Orionid meteor shower. Yet 1,000 years ago, due to precession of the equinoxes, the Orionids would have peaked 14 days earlier on October 8th. The Taurid meteor shower, however, which today peaks on November 5th, would have also peaked 14 days earlier at that time; i.e., on October 22nd. The Taurids were created by debris left over from comet Encke. This shower, which produces spectacular fireballs, appears to originate from the Pleiades asterism within the constellation Taurus. As noted previously, a bird-shaped platform or altar was located at the western end of the Ocmulgee earth lodge. 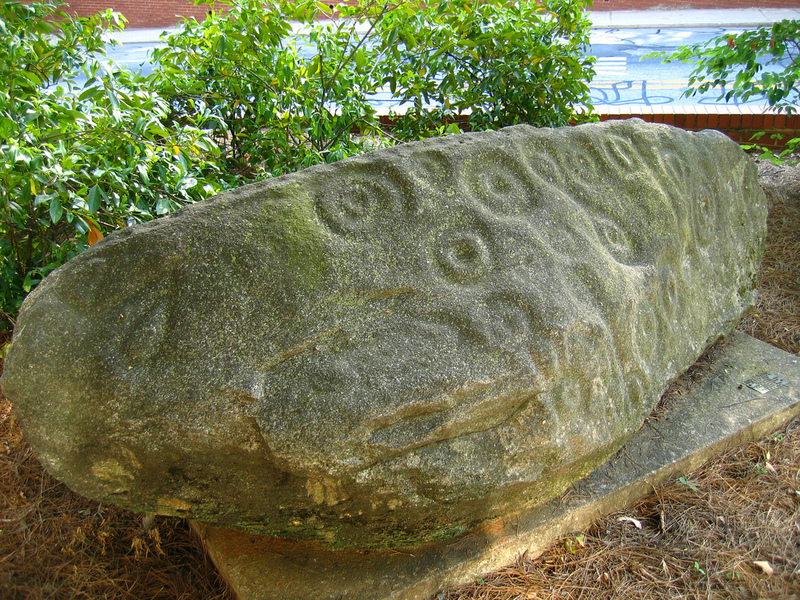 This bird had a design around its eye known as the ‘forked eye motif’ that was in the shape of a two-tailed comet.Thus 1000 years ago on October 22, sunlight would have streamed through the Ocmulgee earth lodge’s doorway and landed on the bird platform with the comet-like forked-eye design. That night the peak activity of the Taurid meteor shower would have occurred. Additionally, using the software program Stellarium, I was able to determine that the Pleiades were very high in the sky just past midnight on October 22, 1015 AD and therefore visible through the smoke hole of the Ocmulgee earth lodge. Thus the very constellation from which the Taurid meteor shower originated would have been visible directly overhead through the smoke hole. 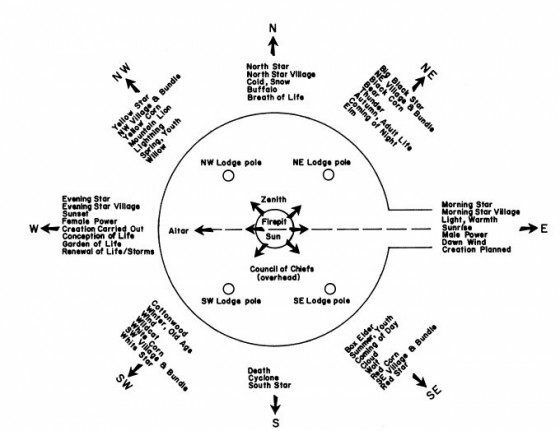 Therefore, the Ocmulgee earth lodge meets all five criteria indicative of its use as a priestly observatory except it was aligned with a significant astronomical event other than the vernal equinox. Curiously, around the same time that archaeologists have dated the destruction of the Ocmulgee earth lodge by fire, a cosmic catastrophe seems to have impacted Earth, likely the result of the Taurid meteor shower. According to the Anglo Saxon Chronicle, on September 28, 1014 AD, a tsunami devastated many towns in England. (In our modern Gregorian calendar this date would equate to October 4, 1014 AD.) Researchers in North Carolina have noted that either a major storm surge or tsunami devastated the coastal areas of the state around this time as well. Considering all the evidence for a major Atlantic tsunami at this time it was most likely this tsunami not storm surge that devastated coastal North Carolina. Other researchers going back through the historical record found that the 11th century featured one of the most active Taurid meteor showers ever recorded. I. S. Astapovich and A. K. Terent’eva conducted a study of fireballs appearing between the 1st and 15th centuries and revealed the Taurids to have been “the most powerful shower of the year in the 11th century (with 42 fireballs belonging to them) and no shower, not even the great ones, could be compared with them as to activity.”Thus the Taurid meteor storm of 1014 must have been truly an awe- inspiring spectacle even greater than the Leonid meteor storm of 1833. Thus all the evidence supports the theory that a meteor slammed into the middle of the Atlantic and produced tsunamis that impacted coasts on both sides of this ocean in the Fall of 1014 AD. Coincidentally, according to Aztec legend, their Fourth Sun ended in 1011 AD due to a great flood followed by the sky falling. 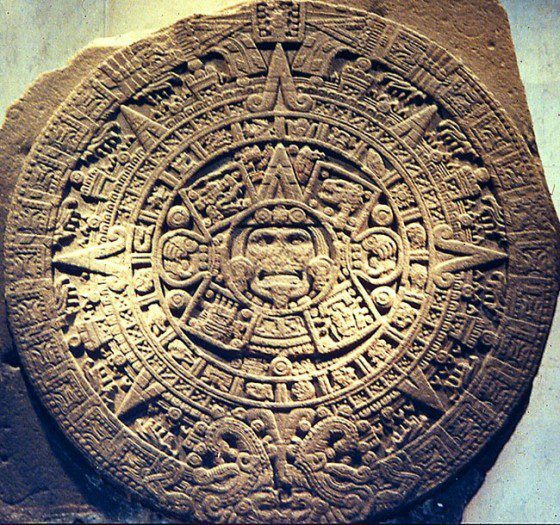 This event is recorded on the Aztec Calendar Stone or Stone of the Fifth Sun that included two xihucoatls, “fire serpents,” around the outside edge of the sculpture. Each “fire serpent” had a snout with seven star symbols that represented the seven stars of the Pleiades. This suggests these “fire serpents” were flaming meteors emanating from the Pleiades and thus were part of the Taurid meteor stream. The Taurids are known for slow-moving fireballs with long smoke trails thus the designation of “fire serpent” is quite appropriate. The fact that the Fourth Sun ended with a flood is consistent with these “fire serpents” having impacted the ocean creating a tsunami. Yet their date of 1011 AD is two years off from the known impact date of 1014 AD. Why? Researchers have noted that after the Aztecs won their independence in 1428 they revised many historical events to fall on important dates within their 52 year calendar cycle called the xiuhmolpilli. One researcher noted, “A number of events of early history were assigned to dates with important positions in the 52-year cycle and that certain types of events were recorded as occurring in years of the same name.”Additionally, astronomer Anthony Aveni noted that “calendrical adjustments were frequently geared to the 52-year xiuhmolpilli or one [of] its multiples….”Thus this could explain why the flood that ended the Aztec’s Fourth Sun and resulted in the creation of the Fifth Sun is said to have taken place in 13 Reed, 1011 AD, instead of the actual date of 1014 AD. The Taurids are active from early October until late November in modern times and a thousand years ago would have ranged from late September until mid November. 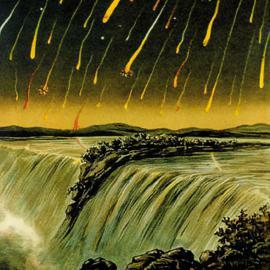 Thus the date recorded in the Anglo-Saxon Chronicle, September 28, 1014 (October 4, 1014 AD in our modern Gregorian calendar), is consistent with an interpretation that two large meteors (fire serpents) part of the Taurid meteor stream crashed into the middle of the Atlantic Ocean and caused tsunamis that spread out and impacted shores all around its perimeter. Is this the reason the people at Ocmulgee burned their observatory sometime around 1015 AD (perhaps even in 1014 AD)? 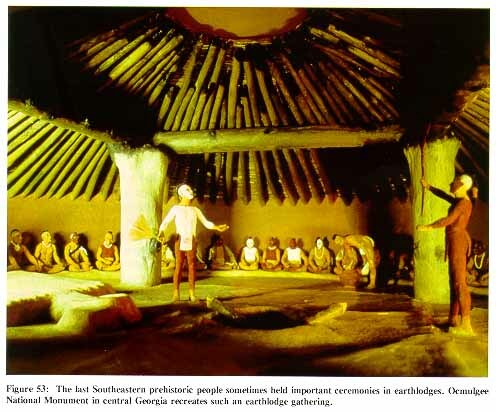 Was the Ocmulgee earth lodge a place where the men of Ocmulgee cleansed and purified themselves through various rituals all with the hopes of appeasing their gods and avoiding future catastrophes? When these purification rituals failed to prevent another catastrophe did they burn the observatory to the ground out of frustration? Or did they believe that such catastrophes could only occur at the peak of Taurid meteor shower activity on October 22nd and when it came earlier on October 4th they realized their doomsday predictor, the earth lodge with its perfect alignments, had failed and was no longer of any use? This type of ritualized behavior was quite common among the indigenous people of North America. For instance, the Aztec Calendar Stone was associated with the New Fire Ceremony and this ceremony, in turn, was associated with the Pleiades. 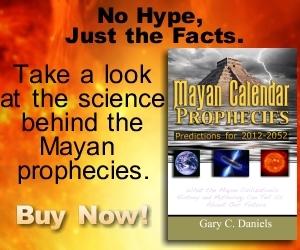 The New Fire Ceremony was conducted every 52 years when the Aztec’s two primary calendars came back into sync. They called this event the “binding of years” and the New Fire ceremony marked the occasion. These New Fire rituals were dedicated to the god Huitzilopochtli. Curiously he was associated with birds and birds were given to him as offerings, primarily hawks and quail. This is reminiscent of the bird offerings found in Pawnee earth lodges as well as the bird platform thought to represent a hawk or eagle in the Ocmulgee earth lodge. A fire serpent descending from the heavens (i.e., top of the pyramid) and bursting into flames once reaching Earth is the perfect metaphor for a meteor impact. In order to test a hypothesis, one must be able to make predictions and then verify those predictions with research data. Thus if the forked-eye surround is truly a representation of a comet or comet fragment (i.e., meteor) then other creatures that wear this design should also have associations consistent with this interpretation. In fact, they do. Those who know say the Uktena is a great snake…with horns on its head, and a bright blazing crest like a diamond on its forehead, and scales glowing like sparks of fire. It has rings or spots of color along its whole length, and cannot be wounded except by shooting in the seventh spot from the head, because under this spot are its heart and its life. The blazing diamond is called Ulun’suti—”Transparent”—…for whoever is seen by the Uktena is so dazed by the bright light that he runs toward the snake instead of trying to escape. As if this were not enough, the breath of the Uktena is so pestilential, that no living creature can survive should they inhale the tiniest bit of the foul air expelled by the Uktena. The fact that the myth includes reference to seven spots may associate this creature with the Pleiades in the constellation Taurus. The fact that this creature is also antlered likely also associates it with the constellation Taurus, the only constellation that looks like a horned animal. There are accounts of meteorite impacts releasing noxious gases that have sickened people, which is also consistent with the Cherokee legend. Among the Lakota Sioux the Unktehi caused a great floodwhich is consistent with other evidence presented earlier. The Ocmulgee earth lodge was an astronomical observatory for the observation of the Taurid meteor shower. The fact that the door of this observatory was aligned with the peak activity of this meteor shower supports this hypothesis. Evidence is suggestive that the forked-eye surround motif on the bird platform is associated with celestial phenomena such as comets or meteors and thus supports the hypothesis. The fact that the Taurid meteor shower experienced an elevated level of activity during the 11th century likely inspired the creation of the Ocmulgee earth lodge observatory. The fact that this observatory’s destruction coincided with an oceanic impact event and associated tsunami likely caused by meteor(s) from the Taurid complex was no accident and was a purposeful response to this catastrophic event. Grantham, Bill. Creation Myths and Legends of the Creek Indians. University Press of Florida, 2002: pp. 149. Townsend, Richard. Hero, Hawk, and Open Hand. p.130 Accessed online 18 July 2012 at < http://books.google.com/books?id=zomCBhVLLGcC&lpg=PA130&ots=-vRdD1Aoo2&dq=celestial%20origin%20of%20forked%20eye&pg=PA130#v=onepage&q=celestial%20forked%20eye&f=false>. Fairbanks, Charles H. Archeology of the Funeral Mound. University of Alabama Press: 2003, p. 6. 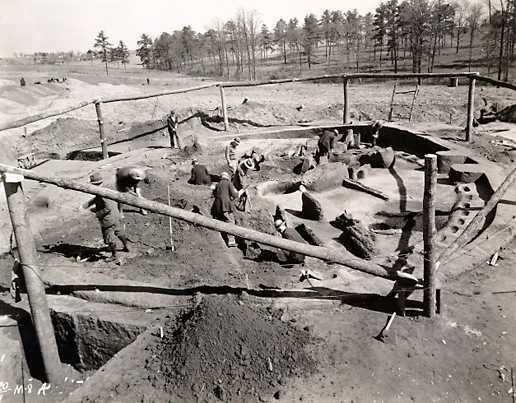 Historic Structure Report The Earth Lodge Ocmulgee National Monument. National Park Service, 2004: p. 1. Accessed online 18 July 2012 at <http:// www.nps.gov/history/history/online_books/ocmu/ocmu_earthlodge_hsr.pdf>. O’Brien, Patricia J. “Prehistoric evidence of Pawnee Cosmology”, American Anthropologist (New Series) Vol. 88, No. 4 (Dec 1986), pp 939–946. Ingram, James (trans). “Anglo-Saxon Chronicles.” Accessed online 24 November 2010 at <http://classiclit.about.com/library/bl-etexts/anon/bl-anon-anglo-saxon-3.htm>. Walker, John. Calendar Converter. Accessed online 17 July 2012 at < http://www.fourmilab.ch/documents/calendar/>. Culver, Stephen J, et al. “Late Holocene Barrier Island Collapse: Outer Banks, North Carolina, USA.” The Sedimentary Record. Society for Sedementary Geology, December 2007: pp. 4-8. Accessed online 18 July 2012 at < http://www.scribd.com/doc/77171096/North-Carolina-Tsunami>. Howard, George. “Hurricane or Tsunami? : North Carolina coast turns to Tar Hell around time of Magna Carta.” CosmicTusk.com. Accessed online 17 July 2012 at < http://cosmictusk.com/hurricane-or-tsunami-north-carolina-coast-turns-to-tar-hell-around-time-of-battle-of-hastings/>. Abbott, Dallas. “Exotic Grains in a core from Cornwall, NY- Do They Have an Impact Source?” Journal of Siberian Federal University. Accessed online November 25, 2010 at <http://elib.sfu-kras.ru/bitstream/2311/1632/1/01_.pdf>. Astapovi?, I. S., and Terenteva, A. K. In Physics and Dynamics of Meteors. Kresák, L., and Millman, P. M (Eds.). IAU Symposium 33. Reidel, Dordrecht. Jenkins, John Major. Maya Cosmogenesis 2012. 1968. p. 308. Aveni, Anthony. “Astronomical considerations in the Aztec expression of history: Eclipse data.” Ancient Mesoamerica, 10 (1999), 87-98. Accessed online 26 Nov 2010 at <http://www.mexicauprising.net/aztececlipsedata.pdf>. Umberger, Emily. “The Structure of Aztec History.” Archaeoastronomy, The Bulletin of the Center for Archaeoastronomy IV (1981):10-18. “Huitzilopochtli.” Wikipedia.org. Accessed online 18 July 2012 at <http://en.wikipedia.org/wiki/Huitzilopochtli>. Townsend, Richard F. State and Cosmos in the Art of Tenochtitlan. p.70 Accessed online 26 Nov 2010 at <http://books.google.com/books?id=Xn-lIHpVG7oC&lpg=PP1&ots=TbZDDrTW11&dq=richard%20f.%20townsend&pg=PA70#v=onepage&q&f=false>. Orozco, Jose. “Meteor Crash in Peru Caused Mysterious Illness.” National Geographic News. September 21, 2007. Accessed online 18 July 2012 at <http://news.nationalgeographic.com/news/2007/09/070921-meteor-peru.html>. “LAKOTA CREATION MYTH.” IndianLegend.com. Accessed online 18 July 2012 at <http://www.indianlegend.com/lakota/lakota_001.htm>. 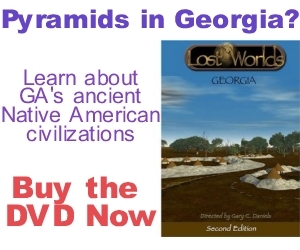 ← Evidence of Fireworks in Ancient America?